The crew members of the SSS Nautilus chose the laughing sawfish as our Ship's mascot. The laughing sawfish is associated with World War Two submarine and submariners. In that most ships bearing the name "Nautilus" were submarines, including the Jules Verne vessel in the classic "20,000 Leagues Under the Sea," our crew members thought it appropriate that we adopt a mascot used by submariners for our Ship . 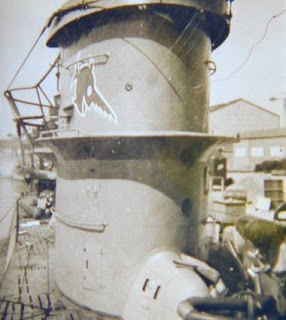 The laughing sawfish was often painted on the submarine's conning tower as illustrated in the photos set forth below. The sawfish uses its saw-like snout to saw holes in the hulls of surface ships, causing them to take on water and sink. Being an impish-like creature, the sawfish then laughs at the trouble he or she has caused, much like the gremlins in the field of aviation. In addition to being painted on the sides of the submarine's conning tower, submarine crews would also sew their mascots onto their side caps and officers would sew them onto the bands of their caps, so as to identify them as being members of a particular submarine or submarine flotilla. While such practices were not permitted by regulation, the higher authorities permitted the practice in light of the high morale that it provided to the submarine crews and in view of the high mortality rate that submarine crews suffered during the war. Submarines were given the dubious nickname of "iron coffins," and for good reason. 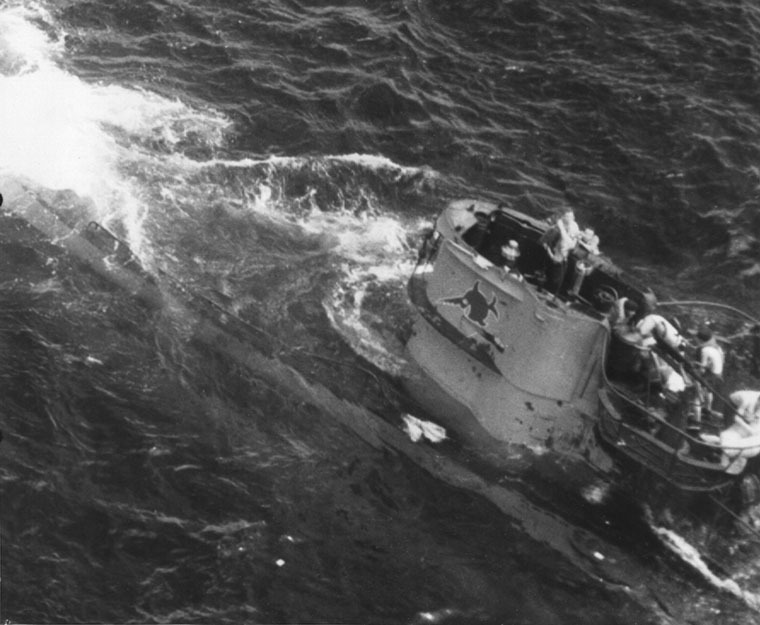 During World War Two, the highest submarine crew mortality rate was suffered by the German Kriegsmarine, which suffered a casualty rate of ninety percent (90%). Nine out of every ten submarine crews which left port during the war did not return and were lost with their submarines. Ironically, the worst submarine disaster suffered by the United States Navy occurred well after the end of World War Two. On 10 April 1963, the nuclear-powered submarine USS Thresher, SSN-593, was lost off of the coast of Cape Cod with all hands. The Thresher had just underwent a refitting at the Portsmouth Naval Shipyard and was conducted a deep water dive test when she went down. A total of 129 officers, enlisted men, and civilian technicians from the Portsmouth Naval Shipyard were lost with the Thresher. Nearly a half-century after she went down, the loss of the USS Thresher remains the US Navy's worst submarine disaster. This page last updated on Monday, 18 February 2013.